In this study we intend to address the question whether variation/fluctuation in rainfall is the primary reason for farmer suicides in India. A quarter of a million Indian farmers have committed suicide in the last 16 years—an average of one suicide every 30 minutes. The agricultural sector in India has become more vulnerable to global markets as a result of economic liberalization. Reforms in the country have included the removal of agricultural subsidies and the opening of Indian agriculture to the global market. These reforms have led to increased costs, while reducing yields and profits for many farmers. As a result, small farmers are often trapped in a cycle of insurmountable debt, leading many to take their lives out of sheer desperation. India is an agrarian country with around 48.9%* of its people depending directly or indirectly upon agriculture. We rank 2nd in the world in terms of Global Farm output. Gross domestic product (GDP) of agriculture and allied sectors in India was recorded at US$156.1 billion in FY14. According to the advanced estimates of Central Statistical Organisation, agriculture and allied sector recorded a growth of 3.6 per cent in FY14 All this while employing directly or indirectly about 48.9%* of our overall population. In 2014, an estimated 1,31,666 people have been reported to have committed suicide. Maximum suicides were reported in Maharashtra (16,307) followed by Tamil Nadu (16,122) and West Bengal (14,310). ‘Family Problems (other than marriage related problems)’ (21.7%) and ’Illness’ (18.0%) have together accounted for 39.7% of total suicides in the country during the year 2014. ‘Other Family Problems’ (1,586), ‘Failure in Examination’ (1,284) and ‘Illness’ (1,105), were the main causes of suicides among children (below 18 years of age). The overall Male : Female ratio of suicide victims for the year 2014 was 68:32. 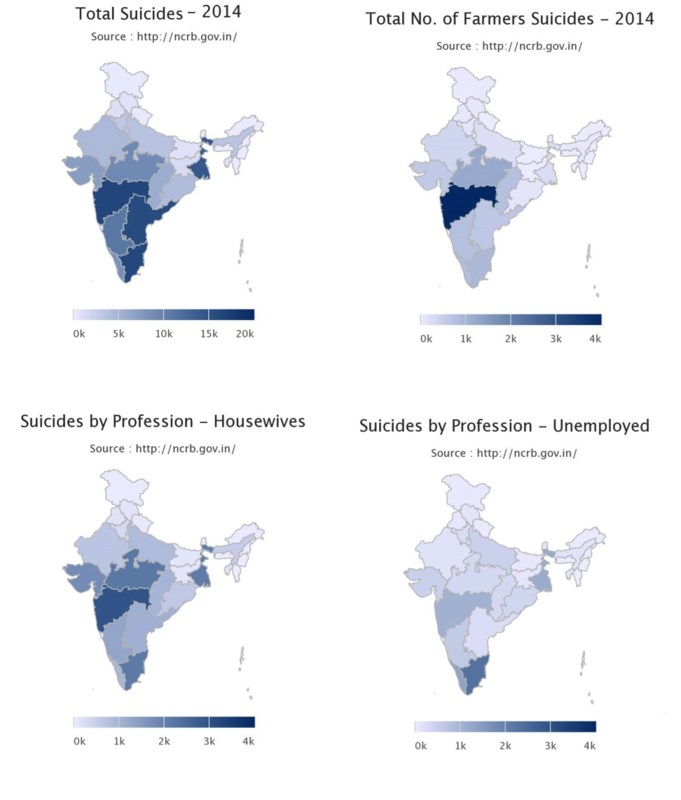 Suicides By Occupations [or Non-Occupations] : MH, WB, AP and TN have highest number of suicides. 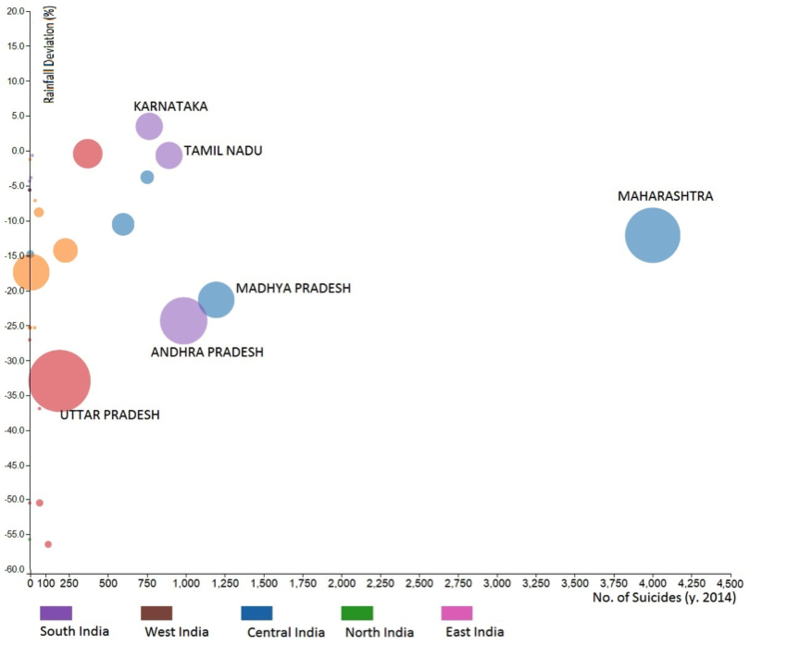 But when it comes to Farmer Suicides, MH stands out sorely compared to other States. We do not see such a stark picture when it comes other reasons, which drive suicides like unemployment. Total Farmers (in Millions) vs No of Suicides (2014) : Although MH has a large farmer population, the number of farmer suicides is 3-4 times higher than norm. Another state with large farmer population, UP, has reported a surprisingly low number of farmer suicides. 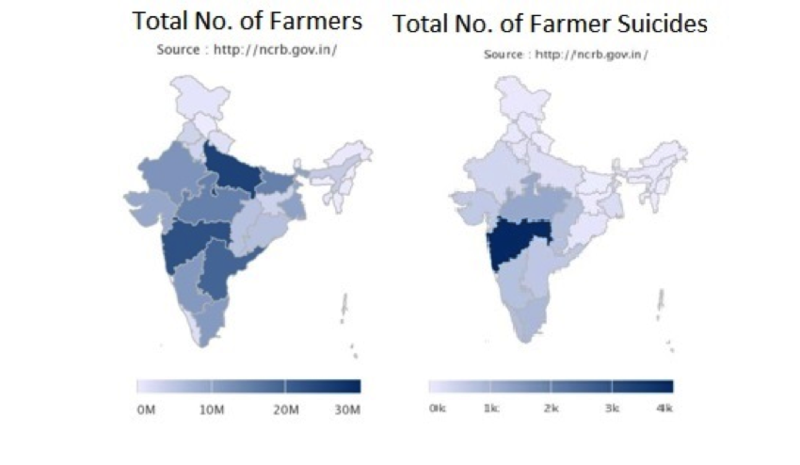 Farmer suicides by state (difference between 2013 & 2014 reported) : If all States were alike (in terms of policies, rainfall and other vagaries) Farmer Suicides map (right) should look identical to Farmer Population (left). In the past few years reports about Farmer Suicides are spreading like wild fire/epidemic. In the period of 2010 to 2014, a total of 5,53,594 suicides were reported in the country out of which approx 60,000 were farmers. Disproportionately high reports about Farmer Suicides: Trend of terms on Google Search [https://www.google.com/trends/] . 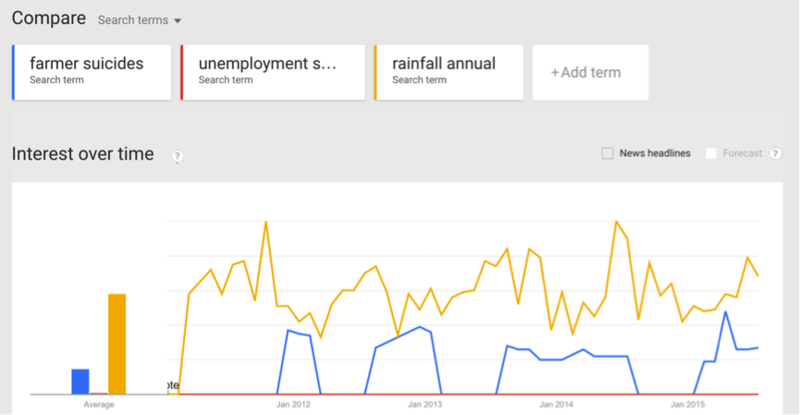 Farmer suicides (blue) is reported and searched much more than ‘unemployment suicides’ (red flat line! ), another big reason for suicides in India. The line in yellow shows the trend for ‘annual rainfall’. While we do believe that variation in rainfall can be a troubling issue for the farmers in India, the statistics shared by the IMD, Pune show us that while there is little deviation in rainfall over the years, the number of farmer suicides follows an almost unrelated pattern. We looked at the deviation of rainfall from the expected 50 year average for every State. High Positive deviations mean Flood, High Negative Deviations mean Drought. We do not see any significant relationship between rainfall deviation and Farmer Suicides. Rainfall Deviation vs #Farmer Suicides: If rainfall had a causal relationship with farmer suicides, we would have seen higher suicides when there are floods [high positive rainfall deviation] or severe draughts [high negative rainfall deviation]. Clearly that is not the case. The size of the State circle represents farmer population in the State. There is a lot of redundant data available which makes the understanding of the articles mystifying. We have taken a few of the pointers and present the insight from those. Having said that we can clearly see that Maharashtra, (Telangana) Andhra Pradesh and Karnataka are facing serious issues that should be resolved on priority, locally.